Lagers present a special challenge to the homebrewer. Despite the dominance of lagers in the commercial markets both in America and Continental Europe, brewing a lager at home is more difficult than ales. This week we take a close look at what’s needed to brew a lager at home and discuss some lager recipes. First time brewers often rush to buy their first lager kit, planning to brew the beers they have always tasted at home. Alas, most of these projects end in disaster since true lagers can’t be fermented properly without refrigeration in the mid to low 50 degree F (around 11-12 C) range. Fermenting at room temperature results in an excess of esters (fruity or spicy), fusel alcohols, diacytl (butterscotch), and sulfer flavors. Also since lagers are very light in body and flavor, any flaws are easily noticed. So you need to ferment cold – at the recommended temperature range for your yeast either using a dedicated beer refrigerator, or cold ice bath (swapping ice out periodically to maintain temperature). Note that most household refrigerators do not adjust to a high enough temperature for lagering, so a separate plugin temperature controller (which plugs into the wall) from a home brew supply store may be required. Mashing Profiles – Many, though not all, lagers are brewed with a relatively light flavor profile and have a clean crisp finish. To achieve this finish, you want to mash at a lower temperature – around 148 F (64.4 C). Some people even use a special two step mash profile for lagers – one step at the low 140′s (60-62C) and a second step in the mid to high 150′s (69 C). This two step lager mash activates both alpha and beta enzymes maximizing the conversion of sugars into maltose – resulting in a light body, more complete fermentation. A Full Length Boil – Dimethyl Sulfide and other volatiles are a problem with many lagers (the creamed corn flavor), in part because lagers are light and it is easier to taste minor flaws. Use a full length boil of at least 70-90 minutes with an open top (no covered pots!) to reduce these volatiles. Oxygen – Aeration of the wort is also important, as lager yeast likes plenty of oxygen. You only aerate BEFORE pitching the yeast, and there are several methods you can use as described here (shaking, aerating and oxygen). 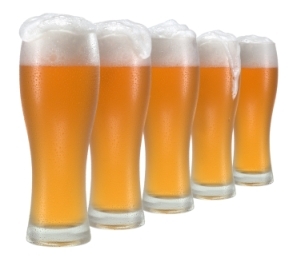 Yeast Pitching Rates – Lagers require more yeast to get a strong, solid fermentation. In fact, the recommended yeast pitch rate for a lager is about twice as much as an ale. Ideally ales should have a 0.75 million cells per milliliter-degree plato pitch rate, and lagers a 1.5 million/ml-P. So a starter is almost always required if working with liquid yeast. For dry lager yeast, pitching twice as much yeast is recommended. Diacytl Rests – Lager yeast produce more diacytl, which is a buttery compound that can be an off flavor. Yeast can reabsorb the diacytl but it requires a diacytl rest – which is done by raising the temperature of your lager a few degrees at the end of fermentation for about a day. It is covered in quite a bit of detail in this podcast with Dr Charlie Bamforth. Patience when Lagering – Lagers require an extended period after fermentation is complete at cold temperature – called “lagering”. DMS (cooked corn smell) , hydrogen sulfide (rotten egg smell) and other off aromas will be present in your beer after it has fermented. Cold lagering for a period of 4-12 weeks is recommended (and often required) for cleaning up your lagers. Pitch New Yeast for Bottling – Since these beers are often lagered at cold temperatures for an extended period, if you are going to bottle your beer you should probably add a small amount of additional yeast with your priming sugar. This will ensure that you get a clean carbonation you expect instead of a flat lager. Obviously if you carbonate a keg with CO2 this is not needed. We covered lagers in some detail on a podcast with Erik Schmid here, and also I covered some tips for brewing a pilsner here. Thanks for joining me on the BeerSmith home brewing blog! Please check out my newsletter, podcast and brewing radio station for more great brewing tips!